Grilled cheese night usually means two things: 1) I’m too lazy, or tired, or lazy, or really lazy to cook a “real” dinner and 2) rehashing of the now 8-year-old debate over which cheese makes a “real” grilled cheese sandwich. One of us expects slices of school bus yellow-orange processed cheese food, which melts beautifully and oozes out of the sandwich in picture-perfect drips. The other expects pricey, in-store, hand-made fresh mozzarella, which melts beautifully and oozes out of the sandwich in picture-perfect drips. You might be a little surprised, but I am the processed cheese food lover of the house. So I bought real cheese. Two real cheeses: horseradish white cheddar and Monterrey Jack. And then I proceeded to make a white pimento cheese using hatch chiles after not being able to think of anything else for like 3 days. I owe that to my friend Liz, who also is responsible for my new two-three-four-episodes-a-night Castle habit. Which, technically, would also mean that she’s the one to blame for the mountain of clean laundry on my bedroom floor bed. Yeah, let’s go with that. But back to grilled cheese. 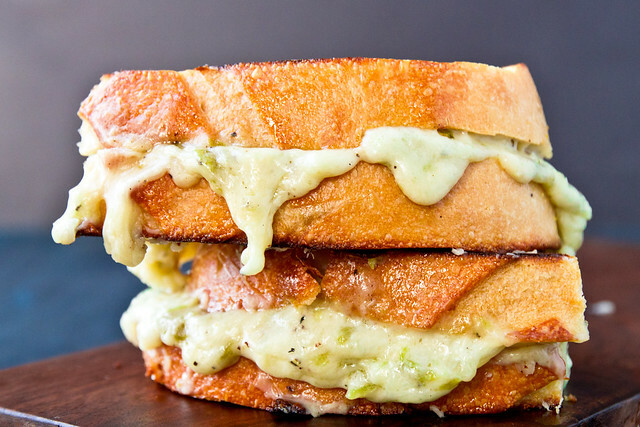 Melty cheese and hatch chiles that ooze out of the sandwich in picture-perfect drips. The Southern classic gets a summer makeover with hatch chiles. And then it's grilled between slices of crusty white bread for the ultimate grilled cheese sandwich. Switch to the chopper blade and add the garlic clove, 1/4 cup of mayo, a dash of Worcestershire, and a pinch of salt and pepper and process 8-10 seconds. Return the shredded cheese to the bowl along with the hatch chiles, and pulse 3-4 times. For the sandwiches, heat a skillet or grill pan over medium-high. Assemble the sandwiches and butter the outsides of the bread. Cook 2-3 minutes on each side, until golden brown and the cheese is melting down the sandwich in picture-perfect drips. This looks absolutely awesome! YUM! I don’t care what cheese is in my grilled cheese, as long as it’s melty, delicious, and ends up in my belly, I call that a successful sandwich! This one, however. Whoa. I might just have to go gourmet next time I make grilled cheese! Grilled cheese is totally real dinner! That looks soooo delicious! Oooo, pimento cheese is a favorite, but I have never tried it grilled, or with chiles. Ah, how the bar has been raised! It looks delicious. Oozy cheese with picture perfect drips, indeed! What kind of bread do you use for your grilled cheese sandwiches? It looks wonderful. And if you say you make your own, I will have to kill you. Haha. No killing required – I bought a round loaf of sourdough from the grocery store bakery for those sandwiches. My stomach is now growling!!! I’ve got to admit, I’m the processed cheese grilled cheese sandwich lover in my house too. Pimento cheese is one of those crazy things: I live too far North to have it near me ever, but blogging affords me a view of it surprisingly often. Each and every time it is a “oooohhh….. that sounds yummy” but it seems to be too far out of my regular head space to remember. I’m going to have to print this and post it to my fridge. Hi! I’m in Upstate NY and I just got some hatch chiles in my market – after reading your site the past few weeks, I HAD to try them out! What tips do you have for the roasting? Do you do them in your oven? Do you roast whole and then scrape the seeds out, or do you cut them up first, etc? You roast them whole, let them cool, rub/peel the skins off (using a paper towel to wipe away the skin works really well, too), and then cut them in half to scrape out the seeds. Once they’re seedless and stemless, I dice them up and freeze them in those little zipper snack baggies. You’re killing me with all of these hatch chile recipes! I doubt I’ll find hatch chiles in China! For now I’ll just have to bookmark and wait for the day when I return to the US and hatch chiles are in season again…. I’m definitely the real cheese lover in my relationship but I think even the Kraft lover would be super happy with this. Those cheese drips are just gorgeous!! From one unashamed processed cheese lover to another, this sandwich looks freaking awesome. My goodness that sandwich looks EPIC!! Must try!! There is a lot to be said about grilled cheese sandwiches. They are amazing (I’m a slight cheese addict) for one, and they can be causal or dressed up to be super fancy. I think I need to make grilled cheese tonight. You inspired me! 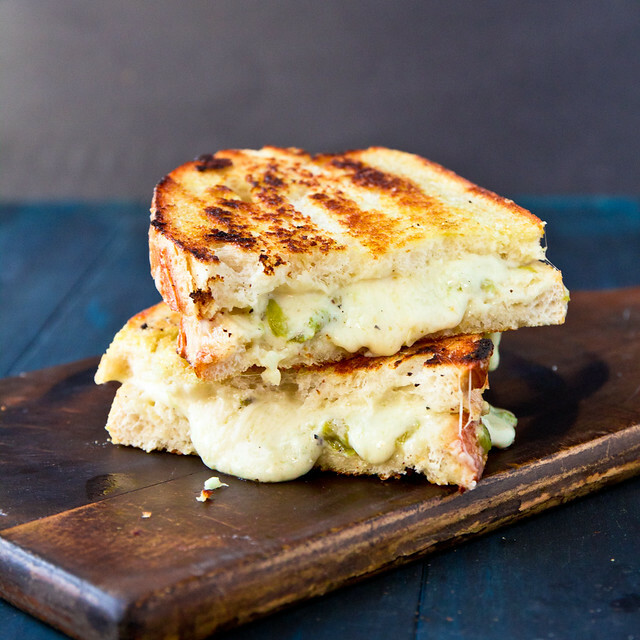 That is one tasty looking grilled cheese sandwich! I am going to have to hunt down some hatch chiles! Oooh, I love the idea of Hatch pimento cheese! They are in season now. If your store doesn’t carry them, go for Anaheim (the closest) or Poblano. Where are the Pimentos in this Hatch Chile Pimento Cheese? ?